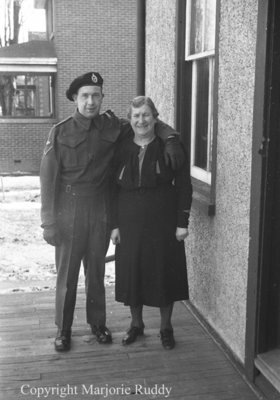 Black and white negative of Lloyd Costello in his military uniform standing with his arm around his mother Elizabeth. They are standing on a wooden porch of a house. Lloyd Rexford Costello was born 16 February 1919 to Thomas (1873-1952) and Elizabeth Jemima (Risebrough) Costello (1885-1967) in Myrtle, Ontario. Mr. Costello was a veteran of World War Two serving overseas with the Ontario Regiment from 1939 until 1945. He married Joyce Joan Shepard in December of 1942 in Lutton, Bedfordshire, England. Mr. Costello died at Oshawa on 18 November 1988 and is buried at Groveside Cemetery, Brooklin, Ontario. Lloyd Costello and Mrs. Costello, April 2, 1940, Marjorie Ruddy. Whitby Archives A2013_040_829A.